Getting to Roatan by air is easy with major airline carriers, including American, Continental, Delta and TACA, flying into the island regularly. 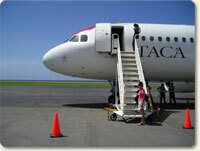 TACA has the best routes & schedules into Roatan- especially if you are flying midweek. Although not familiar to many, TACA is a major Latin American carrier with a beautiful fleet of airbuses and an on time rate of 89% . Many direct flights into Roatan are available. On Saturdays, TACA and Continental offer direct flights from Houston and Delta offers direct flights from Atlanta. On Sundays, TACA offers direct flights from Miami and between February to August, Continental will have flights from Houston direct to Roatan. *This flight is an overnight flight offered several days a week. Flight example reflects a Saturday flight. On other days the arrival time can vary. Multiple return flights are available and vary in route. Note: The example flight itineraries are current as of Jan 2008. Please check with the airlines or your travel agent for the most current available flights. Flights times may change frequently. Note: All of these airports including La Ceiba are still on the mainland. You will need to request a flight that continues or connects into Roatan (RTB). Many search engines will offer La Ceiba as an alternate airport for Roatan. Please note that from La Ceiba, you will need to take a flight to Roatan. Flights are scheduled throughout the day on a number of local carriers.